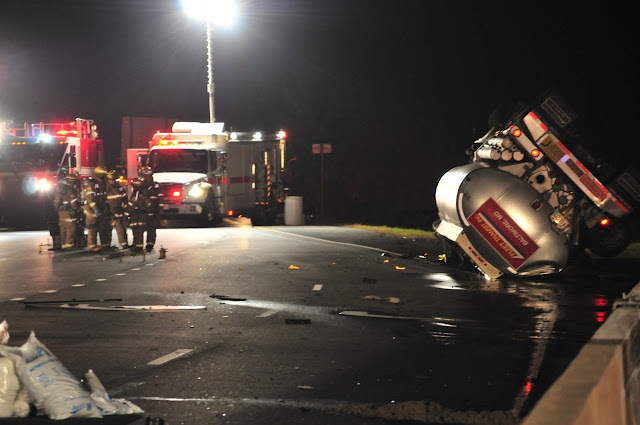 Just after 9:30 pm, Monday, December 5, 2011, a 3-vehicle crash occurred on Route 3 just south of the intersection at Route 450 (Annapolis Road) in Bowie. A passenger car, a box truck and a gasoline tanker (18 wheeler tractor-trailer) were involved in the crash. 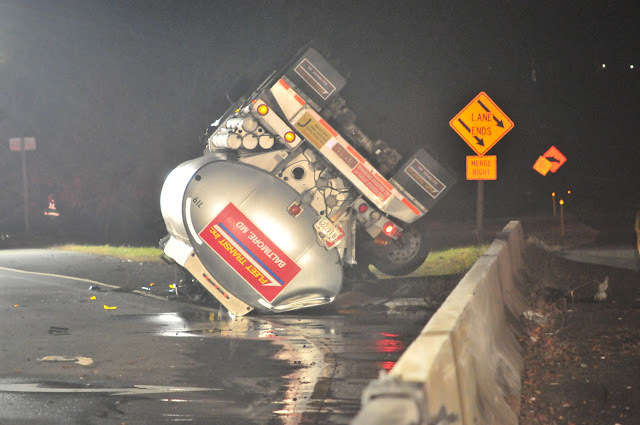 The gasoline tanker, loaded with nearly 9000 gallons of product, overturned and landed in the median strip of the northbound side of Route 301. 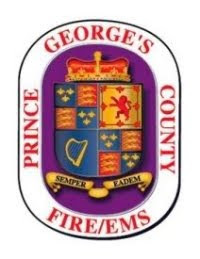 Prince George's County Firefighters, Paramedics and the Hazardous Materials Team responded and immediately blocked access and isolated the immediate area, removed everyone a safe distance away and evaluated the vehicle occupants. 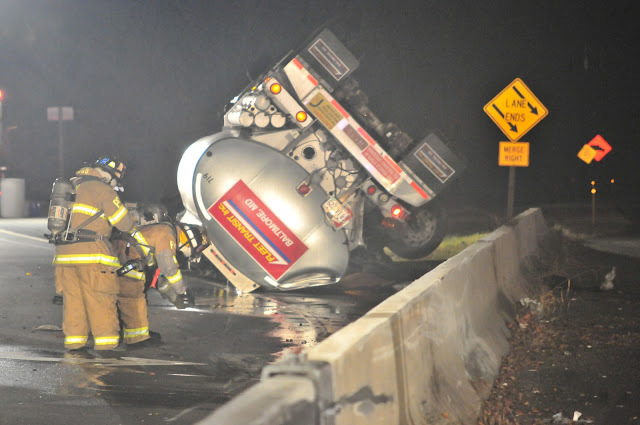 First arriving firefighters initiated a process to contain a relatively small amount of gasoline leaking from the manifold that normally sits on the top side of the tanker. This quick action prevented the product from entering the storm drains. Fortunately, the tanker remained intact during the crash. The driver of the tanker sustained minor injuries and was transported to an area hospital in good condition. The occupants of the other 2 vehicles declined any treatment or transport. Haz-mat crews were successful in capping the leaking product and estimate about 100 gallons had spilled. 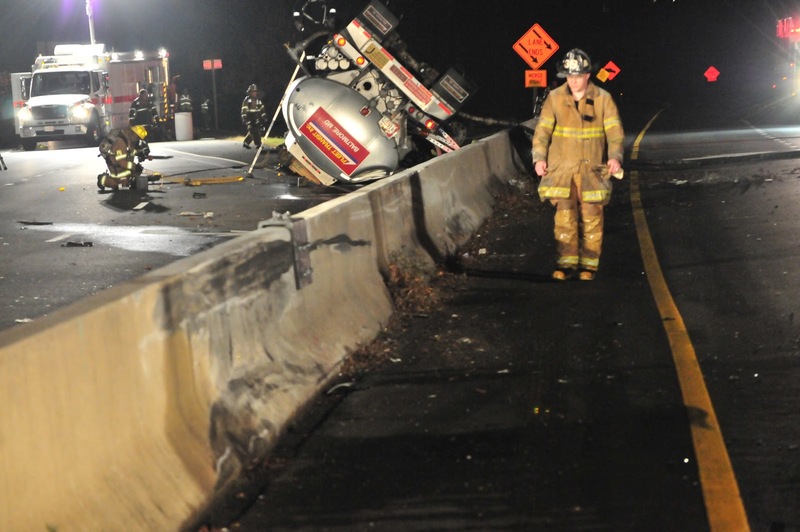 The spilled product has been contained and will be absorbed and removed during the clean-up. Maryland State Police, State Highway Administration (CHART), City of Bowie Police and County Police worked together to closed a number of roads in the area for several hours as crews operated on the scene. There were 84 firefighters, paramedics, haz-mat personnel and ladies auxiliary on the scene. Fire/EMS units from Anne Arundel County as well as Foam Units from Baltimore-Washington International Airport and Andrews Air Force Base provided support and assistance during this incident. The Maryland State Police is investigating the cause of the crash.